• Free ground shipping on orders over $100. *Exclusions apply. Please see individual product descriptions for details. • Offers are valid in the 48 contiguous U.S. states only. • Shipping method of our choice. If a specific method is needed, please contact us at 866-863-2349. • Being Centrally located, our packages reach the majority of our customers in 1 to 3 Business days! ...easily compare shipping methods and pricing for your chosen items. ...(e.g. a 2-Day Air order shipped on Thursday will be delivered the following Monday). 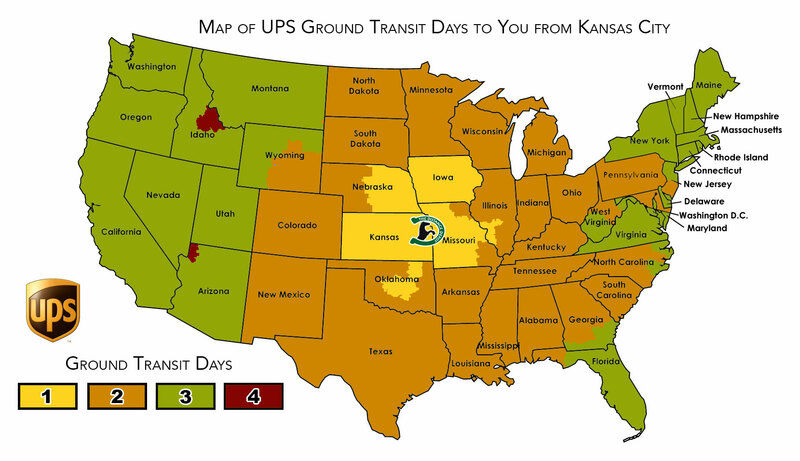 • 48 Contiguous U.S. State Customers - Our UPS Ground shipping charge is based on the weight of the package. • Next Day Air and 2nd Day Air delivery charges depend on the weight and size of the box and final destination. We can also ship orders via U.S. Postal Service. • International Customers, please see our International FAQ page. For additional Shipping and manufacturers information please CLICK HERE.